Neil began his martial arts training in 1981 in the Korean art of Tae Kwon Do under Master J.B. Chung. He also studied Judo and Kendo during his youth. Neil began his study of Chinese martial arts in 1996 under Shifu Ferreira at the Zhong Yi Kung Fu Association. 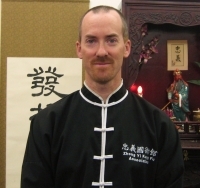 Neil also has researched Bei Shaolinquan, classical Chinese weapons and Chinese martial arts history. He has also had his work on historical Chinese weapons published in Kung Fu Qigong Magazine. Neil is currently an Instructor for the Shaolin Youth program.